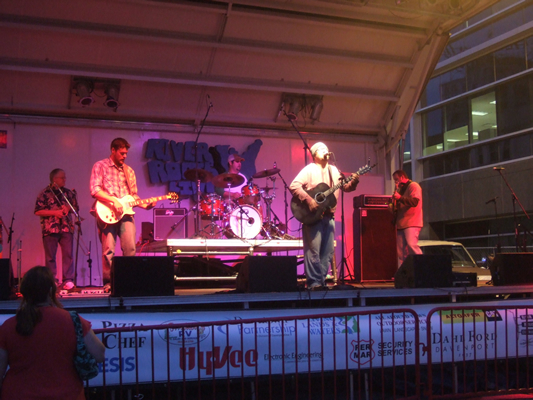 By the first of August, we completed the southern half of the River Road, which is generally thought of as where the Ohio River flows into the Mississippi River. 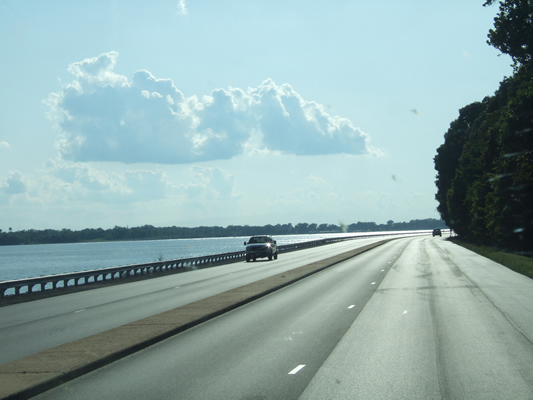 While each of the ten states bordering the river promotes the GRR, we were most impressed with Illinois and Wisconsin in doing the most to promote it and had highways that run along the river. Most places the road were in a mile or so, but that did not dampen our excitement about the history and culture that made up the towns and villages that dotted the landscape of adventure. Another thing we started on this venture was listening to "books on CD." 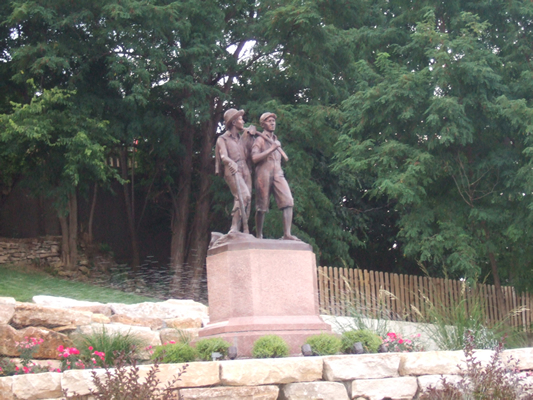 The Adventures of Huckleberry Finn was just the ticket to give us a 1800 perspective of life on the Mississippi. Keep in touch by clicking here Larry and Glorine. 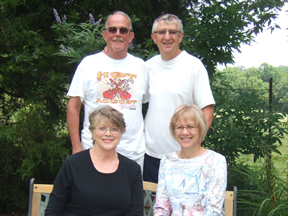 We parked the RV for a week in western Kentucky to spend time with friends we met back in the early 1970s when we lived there. Here we are with Scott and Joy in their back yard. 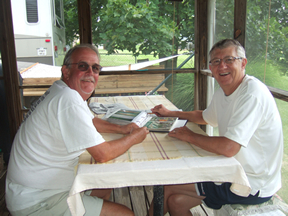 Scott and Larry met while attending Eastern Kentucky University. The weather was great and we even got in a round of golf. Larry and Scott get together at least once a year (whether they need to or not). And most of those get togethers lead to some unbelievable adventures. Here they are going through Scott's photo albums and reminiscing about those adventures. It's a wonder they are still alive. 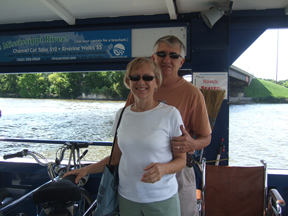 David and Diane were another couple we got to know when we first moved to KY. Glorine and Diane worked together for the City of Richmond. 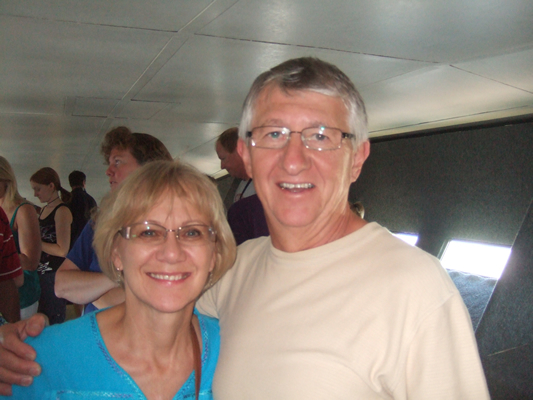 After several months, they discovered they both had the same maiden name--Ressler. 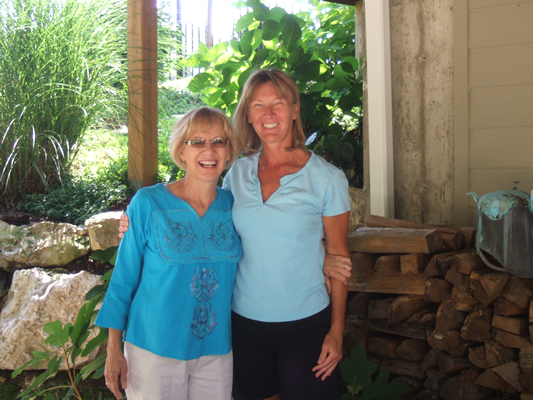 While not related, they struck up a friendship that has lasted nearly 40 years. 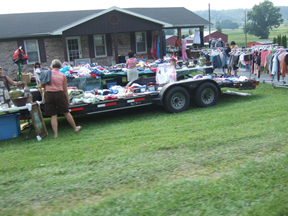 On a road trip through David's old stomping grounds south of Richmond, we ran across the world's "longest yard sale." It is on US Highway 127 and starts in Ohio and runs through Kentucky, Tennessee and ends in Alabama. 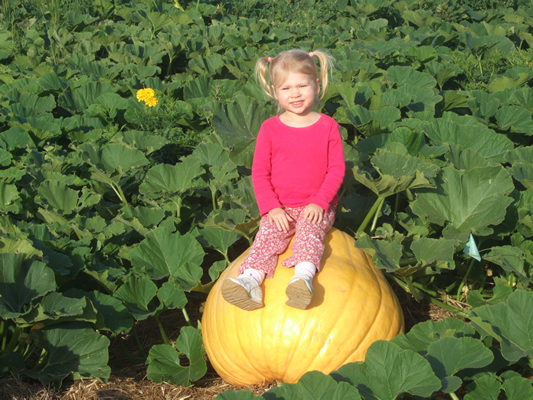 Thank goodness we live in a RV and have no more room for these roadside treasures. 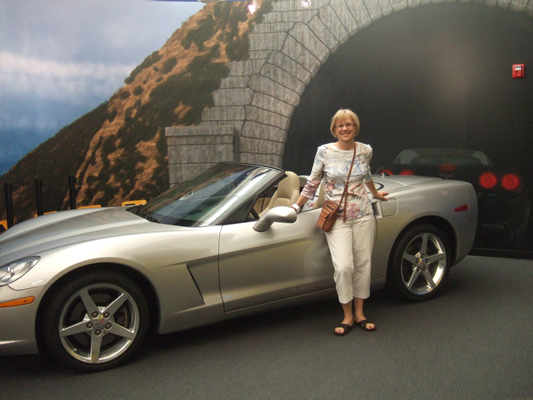 On our trip back to the RV, we toured the Corvette Museum in Bowling Green, KY. It is where Corvettes are manufactured. 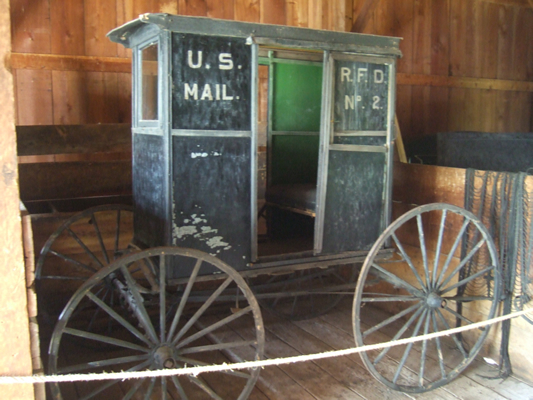 The museum had at least every year's model since the original one came off the assembly line in 1953. As an automobile, it is one of a few that has the kind of history that requires a museum. 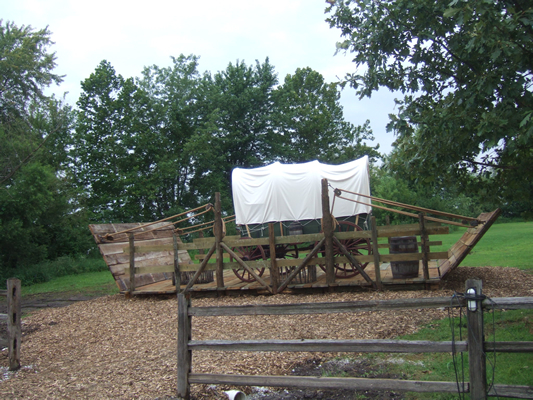 Another sad chapter in American history came to life for us when we stayed at the Trail of Tears State Park in Missouri. It was about the Indian Removal Act of 1830 which forcibly removed tens of thousands of Indians from the south eastern states of the US to the state of Oklahoma. This migration started in the winter of 1830 in which nearly half of the Indian population were killed or died in route. 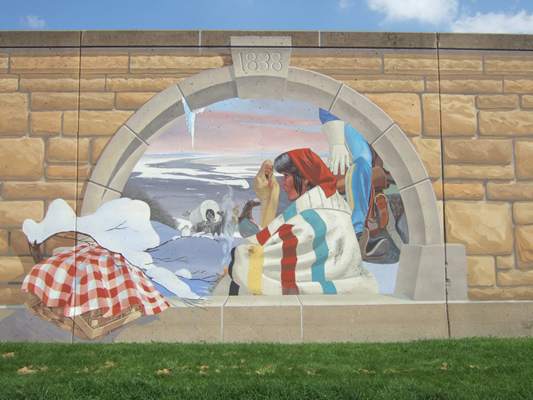 The mural of the Trail of Tears and Death is one of many murals painted on the flood wall in Cape Girardeau, MO, near the Park. 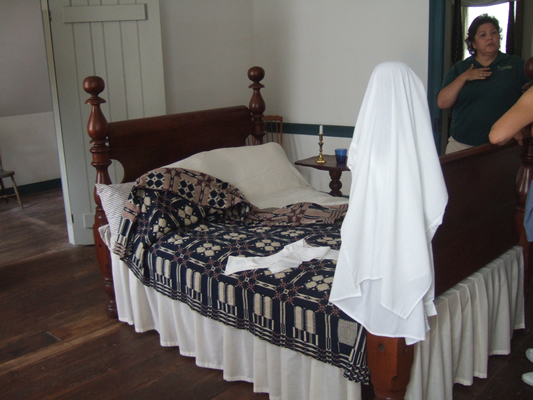 One of our side trips took us to Burfortville, home of two historic buildings. 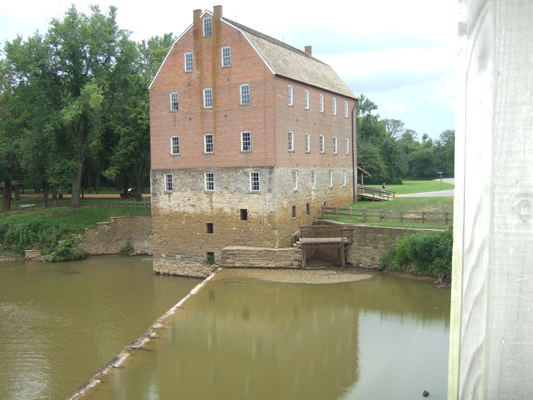 One was of a 19th century mill powered by the water of a small creek that created corn meal. 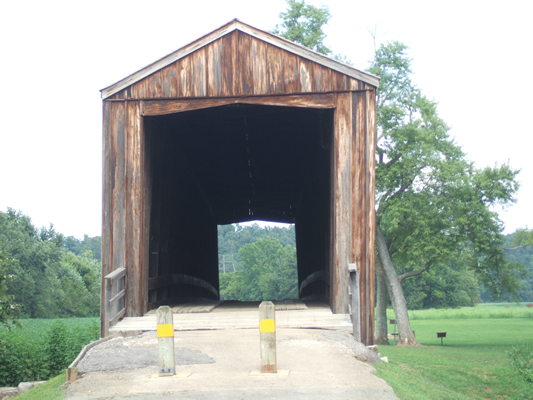 The second is the oldest covered bridge still standing in Missouri, built shortly after the Civil War. 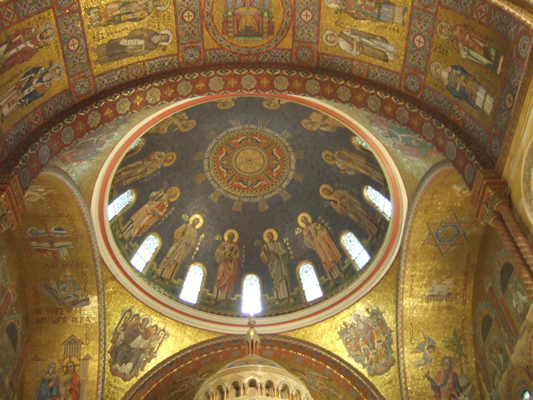 On the trip to St. Louis, we stopped at Sainte Genevieve, which we could have stayed longer. 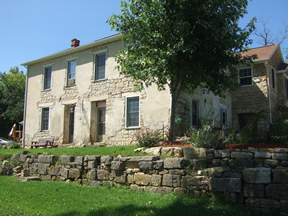 This is one of a dozen homes that date back to the early 1800s that served as both a mercantile and a residence for the Felix Valle family. Our tour guide was great! 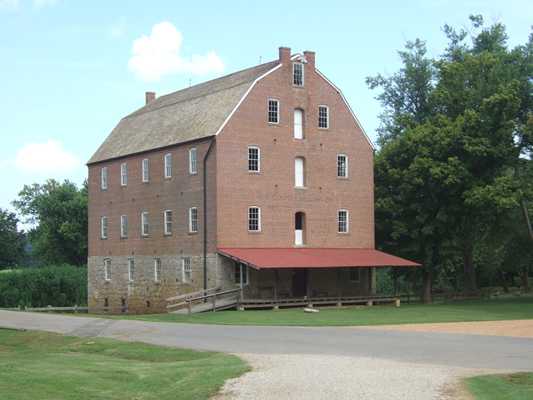 It also has a visitor's center and several wineries in the area. While in Ste. 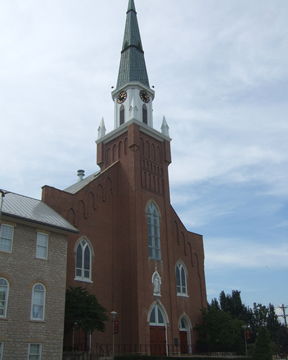 Genevieve, we toured the first Catholic Church built west of the Mississippi, built in 1759 and just celebrated its 250th anniversary. 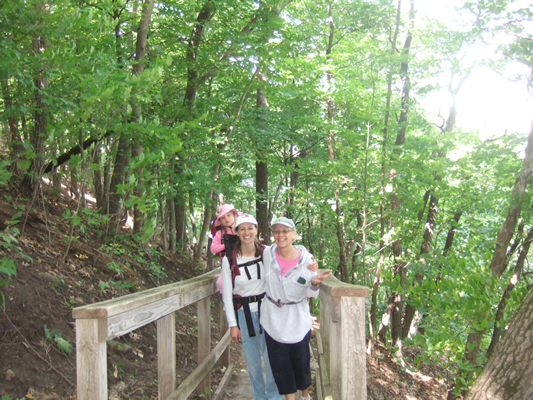 Our stay in the St. Louis area was at Pere Marquette State Park, one of Illinois largest parks. 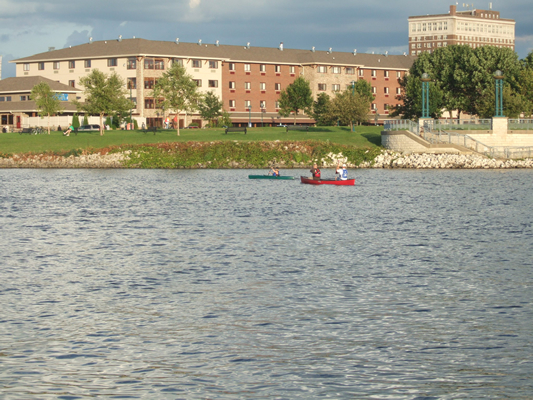 It is located near the confluence of the Illinois and Mississippi Rivers. We car ferried Calhoun County which is a peninsula between these two rivers and found the sweetest peaches outside of Georgia (they say). 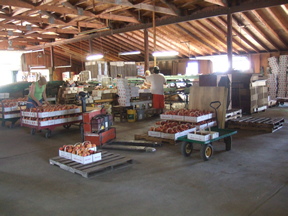 The county is agricultural base and specialize in peaches, but we could find nearly every kind of fruit and vegetable at any one of a dozen markets on the peninula. 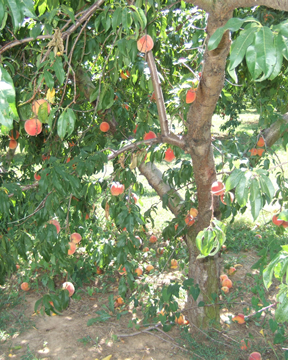 And yes, the peaches were sweet and juicy. 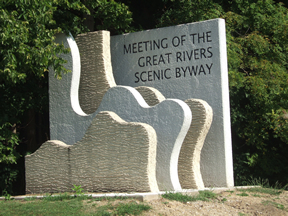 This marker designates an area where the Missouri, Illinois and the Mississippi Rivers all join and sits on one of the five National Scenic Byways we drove along our tour. This is where we snapped the picture on top of this page. 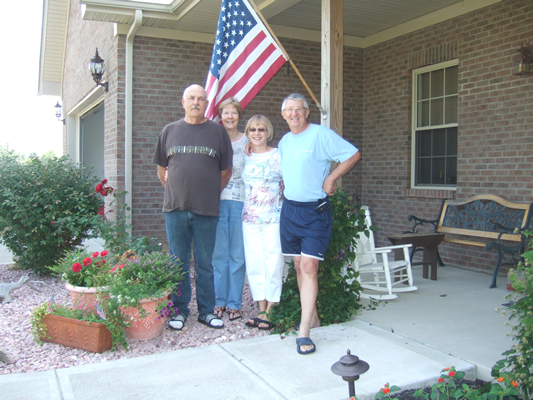 While in the St. Louis area, we made a surprise visit with Glorine's nephew, Ken and Vickie. They have one of the most magnificent homes on either side of our families. 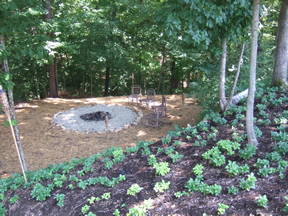 Their back yard is along a wooded ravine and here they carved out a hidden haven for campfires and solitude. The day we arrived, they already had plans to attend a monthly social mixer at their local country club and we got to join them and meet some very nice and very interesting people. Here Kenny already left for work before we remembered our camera, but we did get a couple of pictures including this one of Glorine and Vicki. 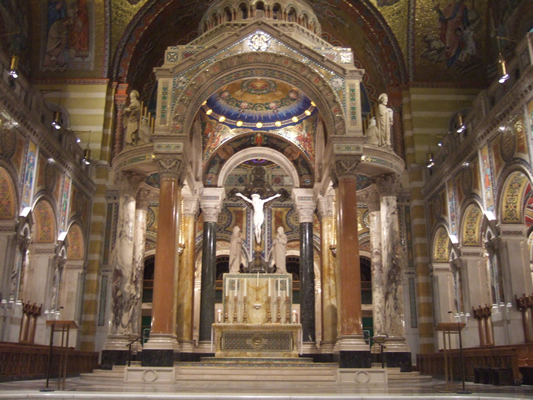 Ken suggested we tour the Cathedral Basilica of St. Louis. After all the churches we have seen in Germany and Mexico, we considered bypassing the tip. As luck would have it, we got detoured through some construction, which put us on the street of this phenomenal church. It was well worth touring. 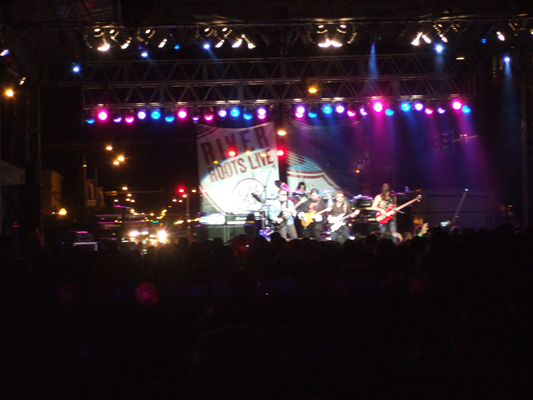 The Great River Road is one of the 12 great American Road trips noted in our tour book and of all these roads, St. Louis is the only city that is on three of them. 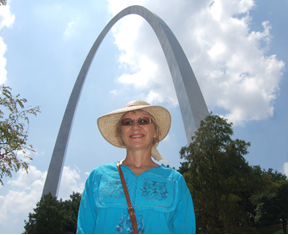 The city is also known for the Gateway Arch which is part of the Thomas Jefferson National Expansion Memorial. 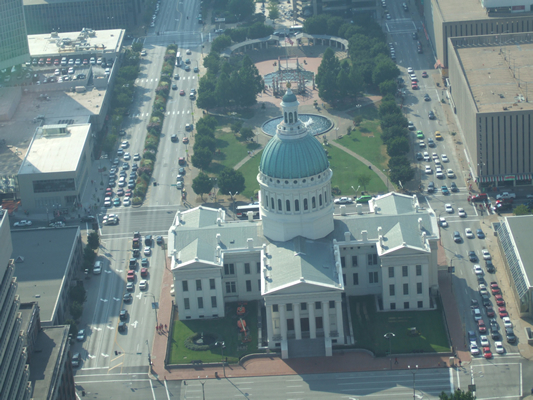 Here are a few of the pictures we took from the very top of the Arch. They include Busch Stadium, home of the St. Louis Cardinals, the county court house, and a couple of bridges over the Mississippi River. 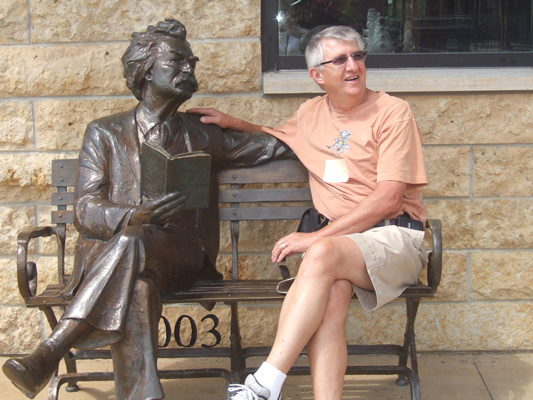 Our next stop was in Hannibal, Missouri, home of the boyhood town of Mark Twain, best known for his tales of Tom Sawyer and Huck Finn (the boys on the statue). FDR dedicated a bridge, which has since been torn down, but the approach to the old bridge is now a memorial to Mark Twain. Here Larry and Mark were spinning yarns when Mark said "It's better to keep your mouth shut and appear stupid than to open it and remove all doubt." Larry is still pondering that thought!! 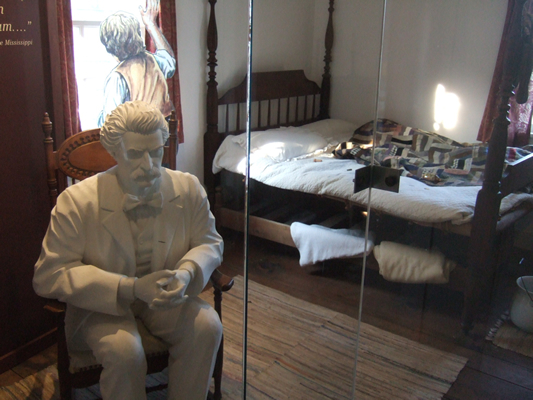 Prior to the Civil War, cotton was king because of slavery and made the plantation owners wealthy. 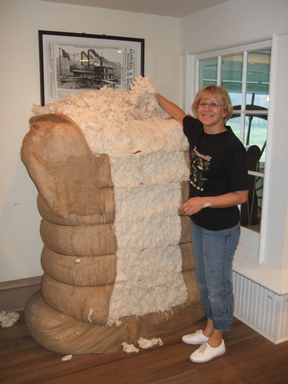 This was the first bail of cotton we saw and it was on display at the Mark Twain Museum. Can't imagine hand picking all that cotton and hauling those bails around. 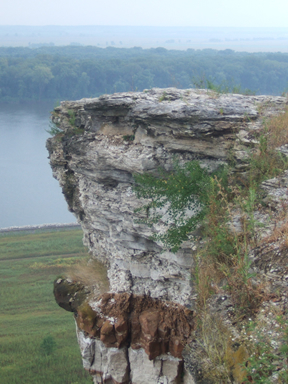 Another point of interest near Hannibal was "Lovers Leap." Its name came from an old Indian legend of two lovers from neighboring tribes who were forbidden from being together and as a result decided to give up their lives rather than not being able to live together. Legend goes that it was at this spot that they jumped off this bluff. 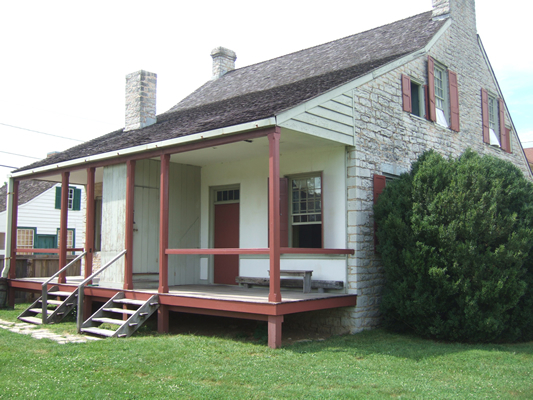 Another tragic part of our history was in Nauvoo, Illinois, but this time it was against the Church of Jesus Christ of Latter Day Saints-better know as Mormons. 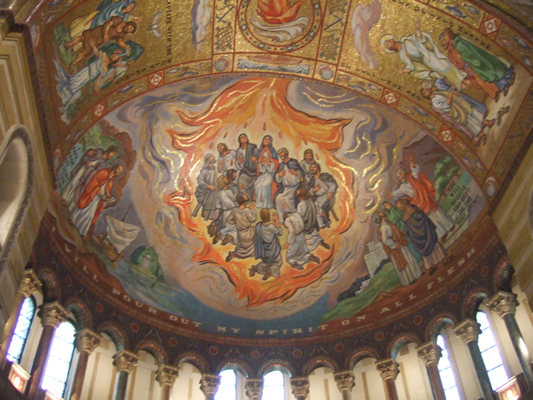 After decades of abuse and discrimination by the locals, it was clear that the church needed to abandon the area and find a new home to practice their religion. 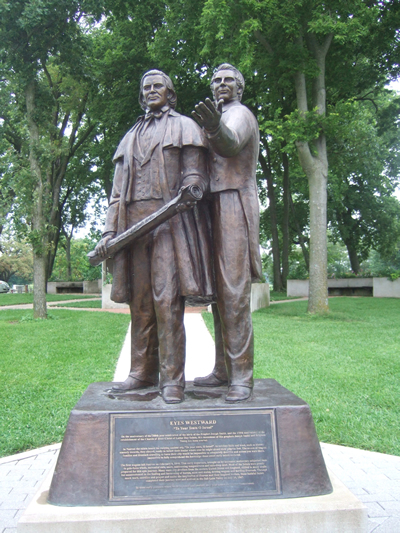 During the winter of 1845-46, Mormon leaders negotiated a truce that allowed them to abandon their city along the Mississippi and journey to their new home in Salt Lake City. 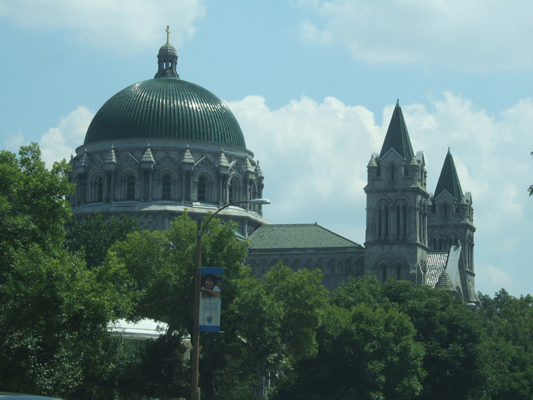 One of the more impressive parts of our tours was in the Quad Cities. 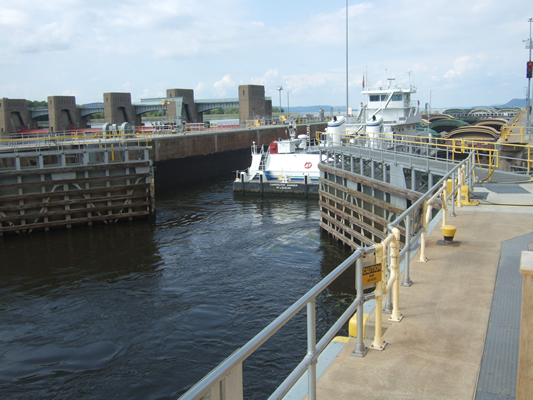 We camped at a Corp of Engineers RV park near one of the Lock and Dams that they operate. This should be noted as the Quin Cities with Moline, East Moline, Rock Island (all in Illinois) and Davenport and Bettendorf, Iowa. Rock Island is home to the largest government-owned weapons manufacturing arsenal in the western world. 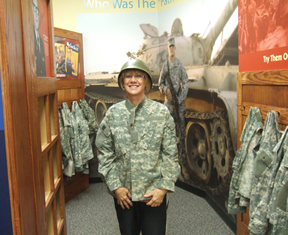 Here is Glorine sporting her new look in desert fatigues. 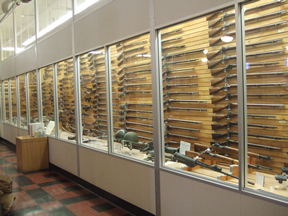 This has to be the biggest collection of military and civilian guns in the world. While we are not gun enthusiasts, we were impressed. 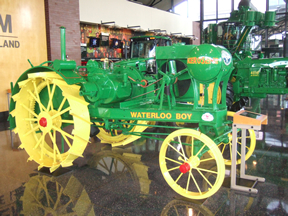 The Quad Cities is the international headquarters of John Deere. They have a great museum and gift shop, which is where we bought Chase's farm set for his upcoming first birthday. 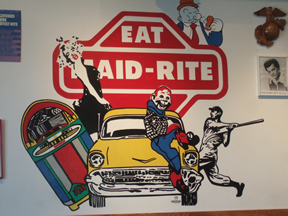 Maid-Rite was founded in Iowa in the mid 1920s and is one of the oldest restaurant chains in the Midwest. They still serve up a great sandwich with unbelievably great service. As we now move through the worst economy since the Great Depression, we took notice of dozens of projects that line the Mississippi River completed by the Civilian Conservation Corps. This was a public work relief program to deal with massive unemployment. 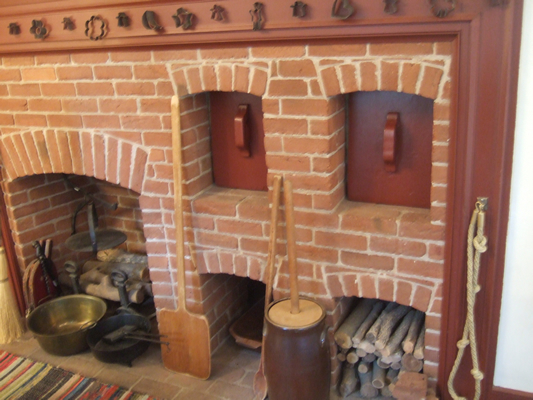 This CCC project houses both the Black Hawk Indian Museum and a museum on the Civilian Conservation Corp. For nearly ten years, a total of three million men took part in this program and is credited in helping America get back on its feet. 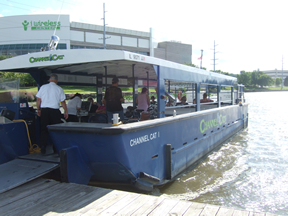 The Quad Cities has a people ferry called a Channel Cat with five stops for each of the Quad Cities. Six dollars per person and you can ride all day. One day we rode the Channel Cat along with our bikes. We planned to ride to a taxi stop and then bike to the next but it rained. So we rode the whole route. It was a very unique and fun day. 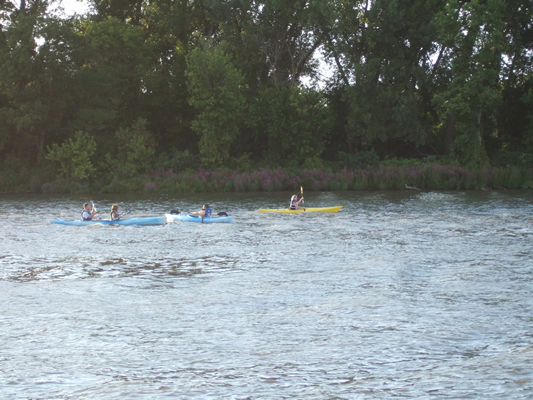 While on the Cat, we saw lots of people enjoying the Mississippi River with their kayaks, canoes and rowing boats. 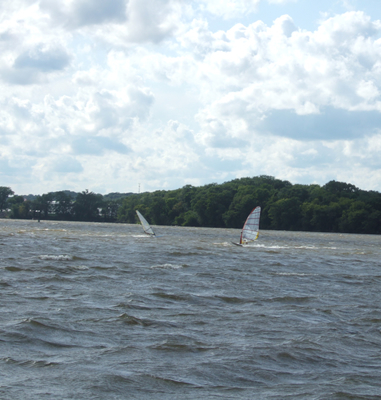 The Illinois side of Rock Island provided the calm waters and Iowa side provided the fast waters for the wind surfers. 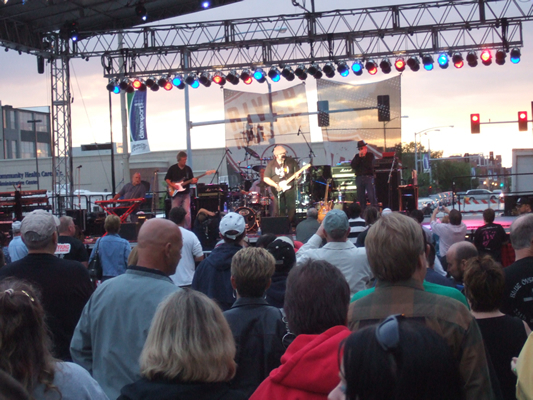 Call it serendipity or not, but Davenport was hosting a free two-day music festival featuring Blue Oyster Cult and about 20 other bands. 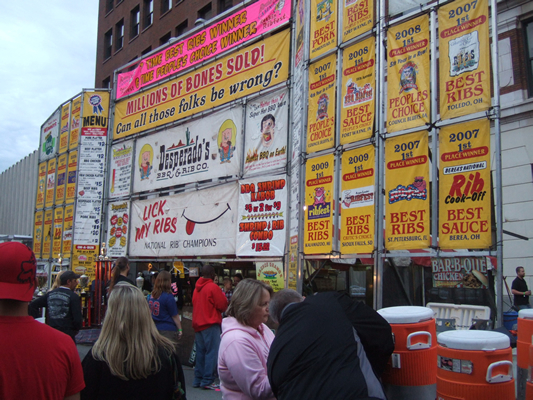 The festival also included a BBQ contest among regional restaurants. 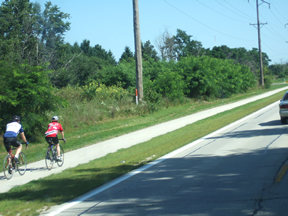 Lastly, the Quad Cities offers bikers hundreds of miles of bike paths that run along the river and is mostly flat. We used our bikes here more than any of our other stops along the River Road. 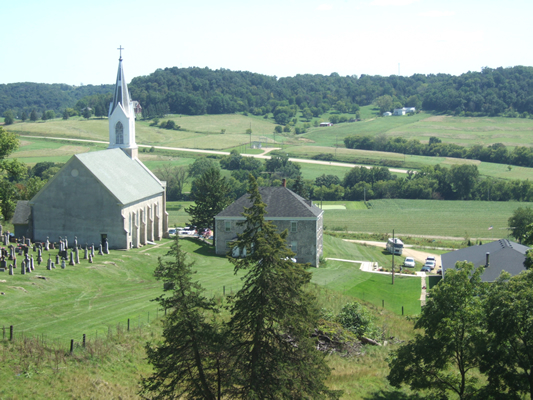 On the way to our next campsite, we stopped in St. Donatus, Iowa known largely for it roots as a Luxemburg village. Its historic architecture is classic Luxemburg. 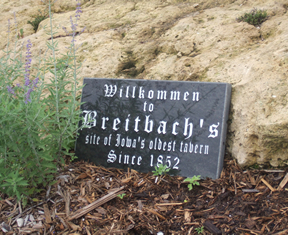 This village is the home of a historic Catholic Church dedicated to Saint Donatus of Muenstereifel. They have a unique hiking trail that starts near the cemetery and winds along the rolling hills featuring 14 statues, one each for the Way of the Cross. 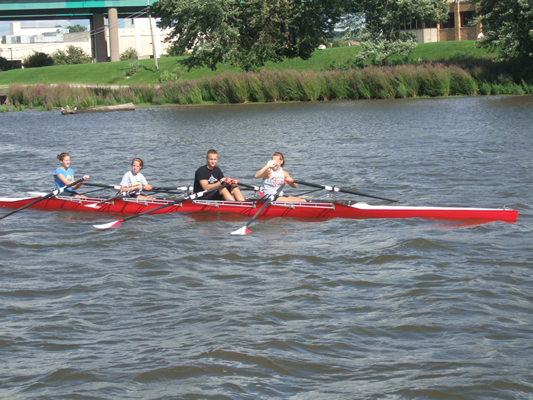 Our next layover was on the river in southwest Wisconsin. 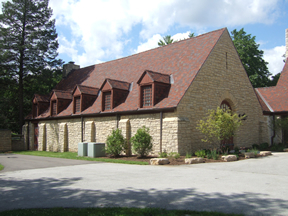 Nearby was a Grotto on the grounds of the Holy Ghost Parish in Dickeyville and hand built by the Priest between 1925 and 1930. 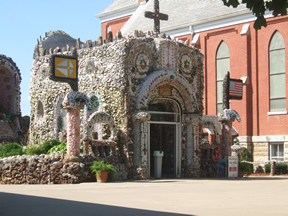 In addition to this Grotto, he built five other shrines made of stones, glass, gems, sea shells and other materials he collected throughout the world. Our campsite was 15 miles north of Dubuque and one of the "must see" sites of Dubuque is the Fenelon Elevator built in 1882. It is billed as the "world's steepest and shortest scenic railway." 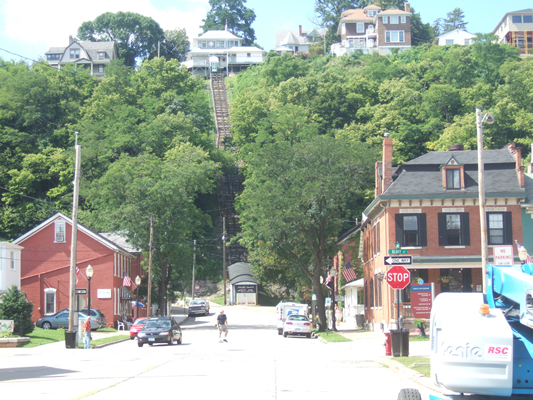 Its purpose was to get the workers from downtown Dubuque up the bluff to their homes for lunch and back to work within an hour. 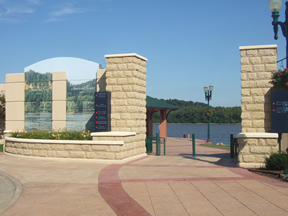 Dubuque is also home of the National Mississippi River Museum and Aquarium, which focuses on the upper half of the river. Together with the Mississippi River Museum in Memphis, they gave a great overview of the vast influence this river had on the American way of life. 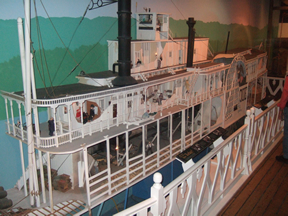 Pictured here is one of the best cut away models of an old steam paddle wheel boat. 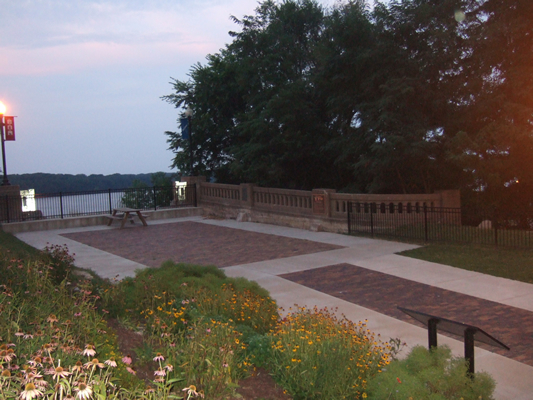 Dubuque river walk is another "must see." It is about a mile or so long and runs next to the river on the top of the levy and along the city flood wall. It was a great scenic walk lined with various businesses. On one of our trips back to the campsite, we saw this pile of campfire logs. When we stopped, we noted it was self serve. 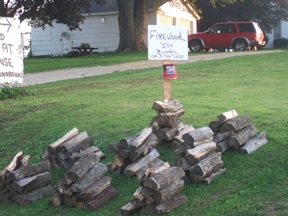 Five bucks for a bundle of firewood and you deposit the money in the coffee can. We saw several of the "honor" system stands selling everything from sweet corn and veggies to firewood. This is something you don't see everyplace. About a mile from our campsite was an old brewery that operated for 156 years. 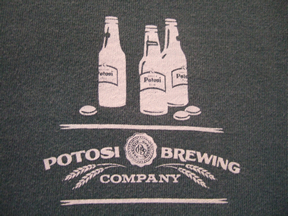 They survived the prohibition, but ran out of steam and closed their door in the 1970s. Last year it reopened as a microbrewery but also as the National Beer Museum featuring memorabilia from two centuries of American beer making. 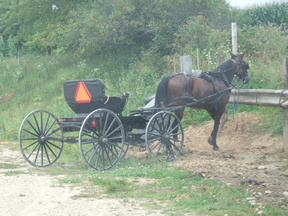 As we traveled the rolling hills of Wisconsin, we passed several horse drawn buggies with Amish people. Unfortunately we did not have our camera to capture their Sunday afternoon rides. The closest we got was this horse and buggy parked. One thing we learned is that at the current rate Wisconsin will soon have the fourth highest population of Amish. 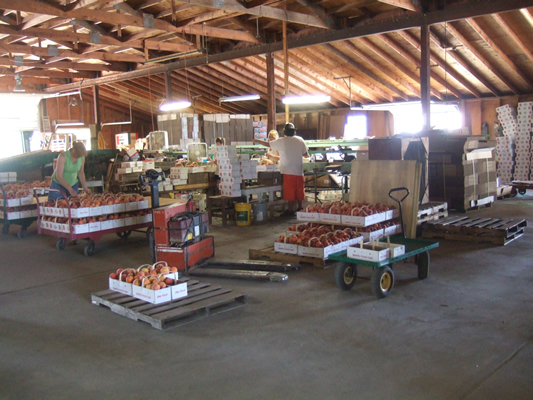 One of Iowa's hidden culinary treasures is in Balltown. 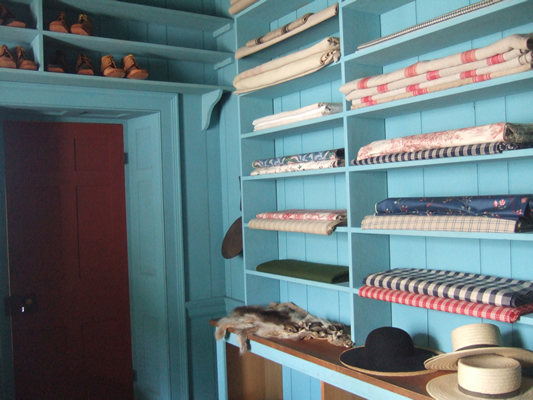 It was founded in an old stagecoach house and has been in the same family for six generations. Most of the food is made from scratch and reasonably priced. 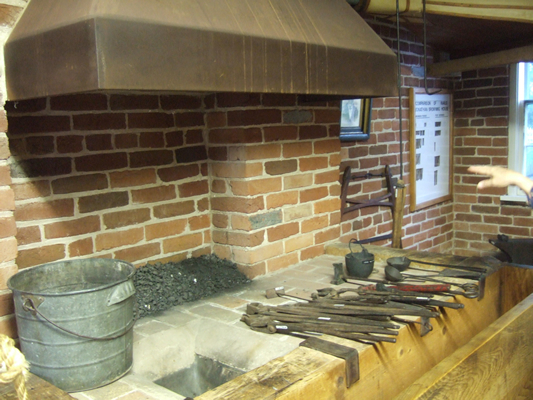 Founded in 1852 under a permit issued from President Millard Fillmore. As a bonus, it is on the second-highest point in Iowa, which offers great views of the Mississippi River Valley. 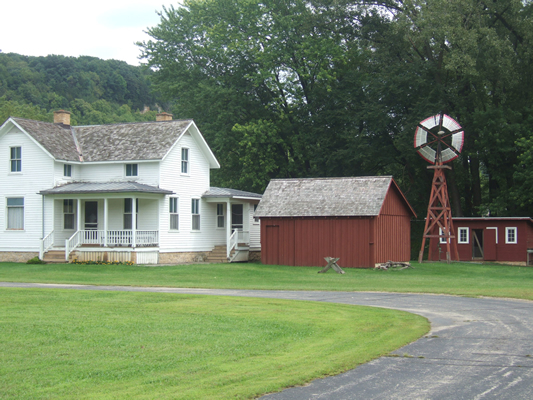 Wisconsin has an 1800 recreated rural village and farm near the river town of Cassville. 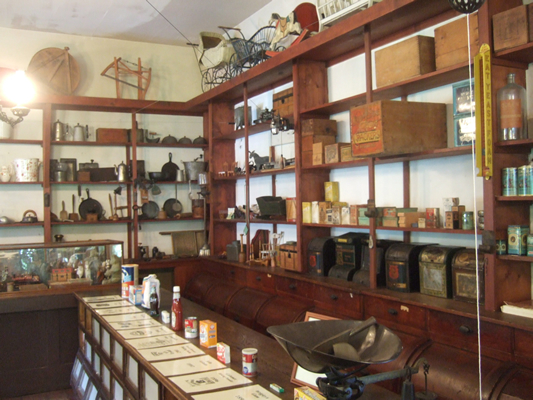 It has over 30 stores filled with time specific memorabilia. 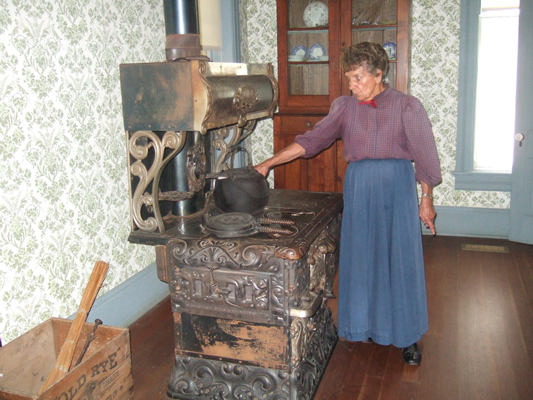 It is also home of the State Agricultural Museum which also has one of the largest collections of historic farm equipment. 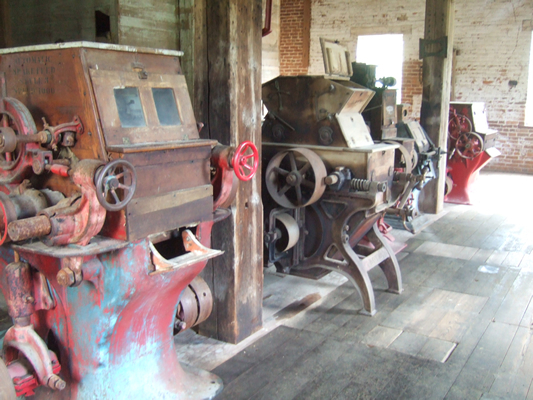 As a kid growing up on a farm, Larry had a great time touring the buildings and machinery. It was well worth the trip. 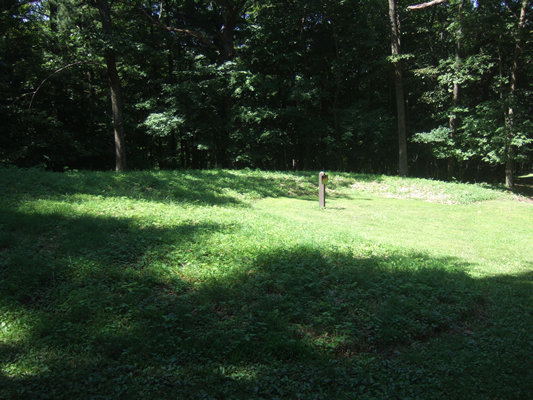 Another new experience for both of us was the many Effigy Mounds dotting the landscape of Illinois, Iowa and Wisconsin. An Effigy Mound is a burial site for Native Americans, with no head stones, but the area in which they were buried resembled an animal like bears, eagles, etc. This particular mound is shaped like a bear and is located in the Pikes Peak State Park in Iowa. 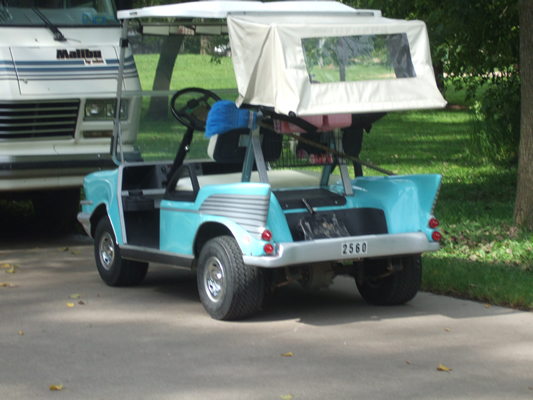 We have seen some cool golf carts before, but this replica of a 1957 cart takes the cake. It is actually used by one of camp hosts to make the rounds and keep the park in top notched condition. 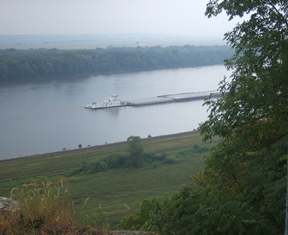 Barge traffic is a common scene on the Mississippi River. 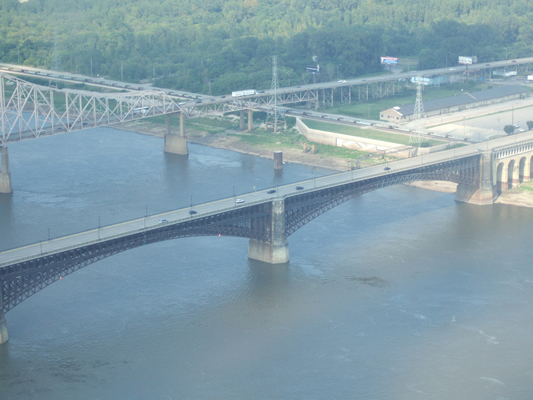 The difference between the upper and lower portions of the river is that there are no dams or locks south of the Ohio River. 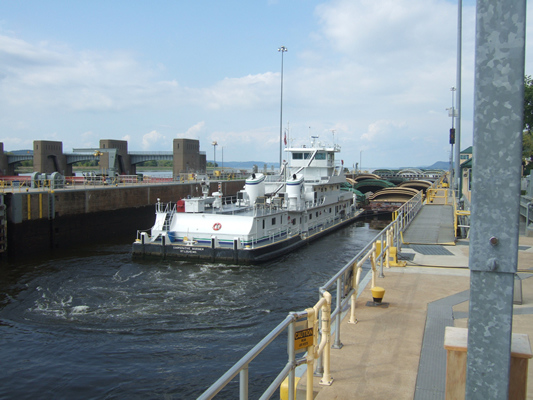 To create a safe passage way from Minneapolis to the Gulf, Congress approved an ongoing dredging project to maintain a river channel nine feet deep and 400 feet wide. 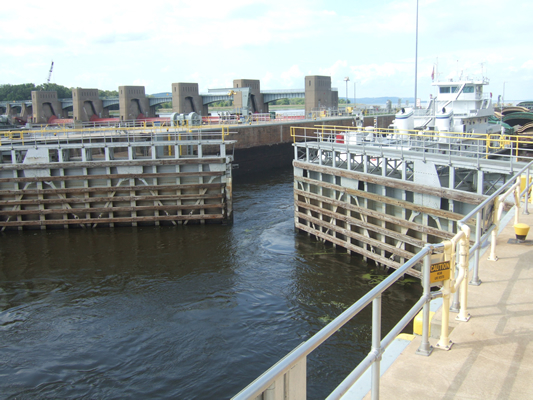 To navigate the upper river which has a nearly 400 foot drop along the 670 mile stretch between Minneapolis to Granite City, Illinois, Congress approved the creation of 29 locks and dams (one shown here) to allow barge and other river traffic to move up and down these varying elevations. 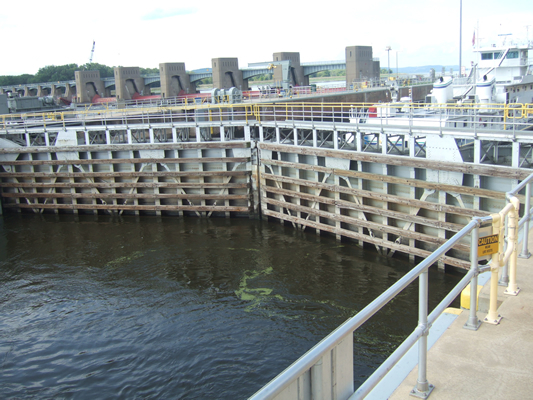 It took 46 years between the completion of the first lock and dam in 1913 in Clinton, Iowa and 1963 for the St. Anthony project in Minneapolis. 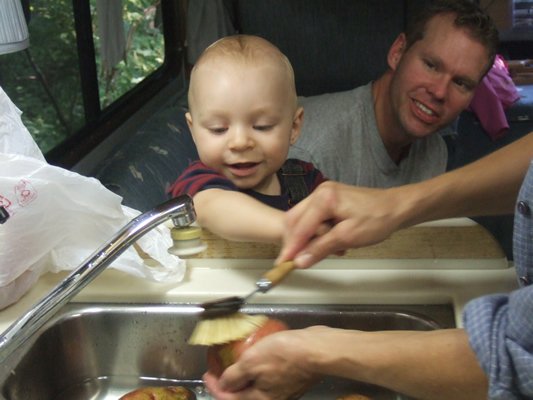 Our last stop along the Great River Road was one of our most enjoyable experiences. 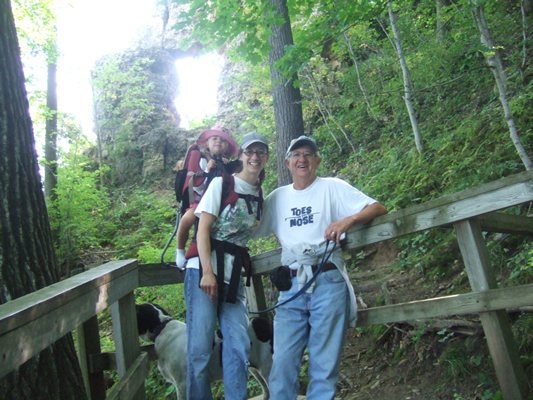 We were joined by our daughter, Denise, Craig, Clara and Chase. Along with lots of hiking, Clara found a GeoCache, Chase dipped his toes in the Mighty Mississippi River and we all had lots of SMORES. We noticed a major change in Chase as he had become more curious and watched and touched about everything in sight. 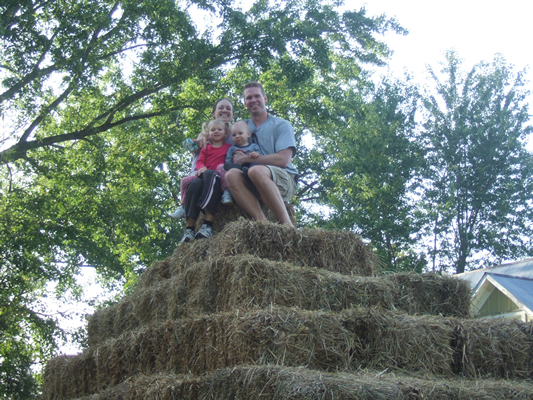 We took a day trip on the Wisconsin side and stopped at a winery that had a corn maze, stacks of bails, and a huge pumpkin patch. 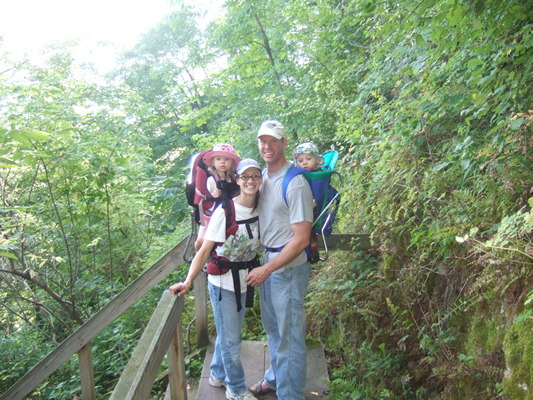 The beauty of the State Park made our hikes fun and exciting. 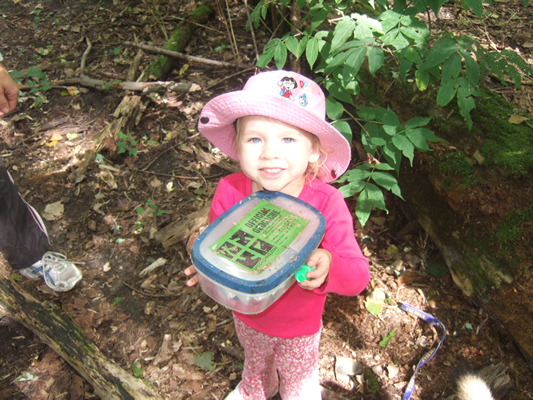 The overall GRR trip was a phenomenal adventure and our July and August web updates only touched the surface of the things we saw and experienced. It was truly a big adventure! !